To browse and purchase clay, click here for our online store. New to the world of therapeutic clays? 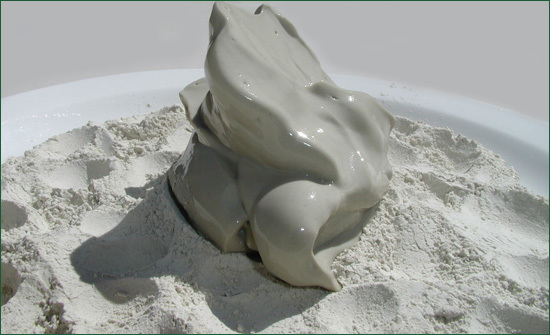 Read our article: Therapeutic Clay Uses. We are pleased to offer some of North America's finest therapeutic clays at unprecedented wholesale prices for bulk purchase, as well as French green clay imported from France. Our green desert clay has a documented history of human use dating back over 200 years, and can be used for all clay therapy applications, including cosmetics and for use in internal cleansing and supplement programs. We also produce a line of exceptional specialty clay blends. We know clay inside and out! If you are not sure which product is right for you, email us, and we'll be glad to help. We have over 20 years of experience studying the therapeutic clays of the world. Go Paleo! We are now offering a fine blend of therapeutic clays for external daily use. 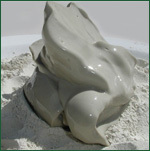 Green Desert Calcium Bentonite Clay. Our signature clay, which is a magnesium-rich, calcium bentonite/montmorillonite alkaline clay milled to 325 mesh. This clay may be used internally or externally. Three clay supplement blend: Red desert calcium bentonite, green desert calcium bentonite and sodium bentonite. The perfect product for deep colon cleansing and digestive system repair. We now have an option for purchasing the three clay blend with fresh water (food grade) diatomaceous earth. Two clay supplement blend: Edible green calcium bentonite clay and red desert calcium bentonite. This product has been forumated for those who don't desire or who don't need the swelling sodium bentonite. This clay blend is excellent for trace mineral supplementation, detoxification protocols, and external use poultices, compresses and comsetic applications. Three clay external use blend: Cosmetic, facial, spa, and general topical use clay. A blend of pyrophyllite, red desert calcium bentonite, and green desert calcium bentonite, perfect for skin care and topical applications. Micronized ultrafine zeolite powder - The perfect complement for edible clay therapy, and an important tool to assist the body in detoxification. Food Grade magnesium chloride flakes - Make your own high quality, high potency magnesium oil, or use in a clay or sea salt bath. USP grade sodium bentonite for colon cleansing and digestive healing. USP grade sodium bentonite and red desert clay - Our great tasting two clay blend that acts both as a supreme mineral supplement and deep cleansing and detoxification supplement. French Green Clay - Illite - Granulated green illite from France... The original French therapeutic healing clay. 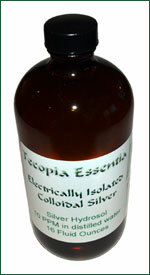 Electrically Isolated Colloidal Silver Hydrosol - 10 Parts per million, 85% ionic, 15% nano-particulate. Our unique electrically isolated "colloidal" silver is batch produced using state of the art electrolysis equipment. The mid-ranged and large particles in solution are then atomized using activated oxygen. The colloid is then aged, tested, then stabilized using electromagnetic energy produced by cold plasma technology. Contact us for further ordering information and discount schedules.